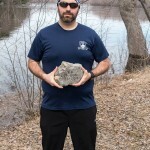 On April, 18th I had the honor of being the caretaker of James Zimmerman’s stone at The Zimmerman Fitness Challenge held at the University of Maine in Orono. Over the long weekend I had a compelling journey with it: not just a physical outing, but a deeply profound and thought-provoking experience. The night before the ZFC I traveled to Augusta to meet up with two members of my TSP family, Ted Coffin and Andrew Coleman, and even though I hadn’t seen them in a few months I was welcomed right back with open arms. 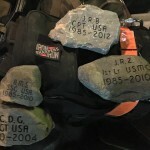 I said my goodbyes and then received the stones of James, Brandon Silk, Christopher Gelineau, and John Brainard for our team and started my travels back home to prepare for the morning. 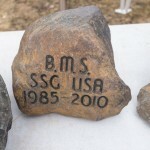 As the miles passed by, with the stones in my passenger seat, I felt a tremendous emotional connection, that I could not withstand. I had only made it to Newport when I had to pull over and look at them.The first stone I held in my hands was James’. A mere rock that had been overlooked for years, now is a symbol of solidarity for the family that lost a precious part of their lives and I found myself blankly staring at James’ for 20 minutes. The stories I had heard of James all came flooding back to me while I was sitting at the rest stop. It was quite overwhelming and I started to doubt my abilities to carry it the next day. From every source I researched about James I learned he was an excellent leader his men looked up to, that he pushed them hard, and was always there for them when the times got tough. I decided that I would let James push me and his memories guide me through the day and the ZFC. I had never met James, but I could put a voice to his picture in my mind. 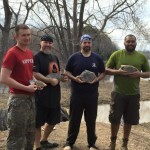 On the day of the ZFC, I met up with our team, Tony Llerena, Spencer Smoot, and Tom Hayden, and handed out the stones we would be carrying all day while meeting them, essentially, for the first time ever. 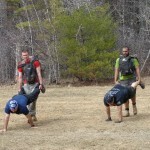 We did the ZFC a little differently than the other teams as we carried weighted rucks the entire time throughout all the evolutions and movements. What we were doing was in the memory of a soldier that hadn’t come home and for a family that would trade anything for one more day with them. It wasn’t ever about our ego, pride, or to say “look what I did”. Time did not matter; only the team mattered. Before the start of the ZFC, I met up with Tom and Jane Zimmerman and introduced myself. They are truly amazing people. They encouraged us all and participated in the Challenge as well. During our pack run I started noticing what a difference we were making in the morale of those around us. Many people that knew James would come up and touch my pack or say a kind word on what we were doing. I knew at this point that all my doubt from the night before was gone and we gave the field our very best that day. It was a day of never leaving a teammate behind to struggle and forming our own bonds of family with each other that afternoon. That is what James was all about and throughout our trek I could hear him saying “we got this”, “this isn’t hard”, and “help your team”. At the end of the ZFC and I introduced my wife and son to the Zimmerman family. TSP is all about family bonds and I wanted my family to know theirs. We all have different backgrounds, but the family bonds we build around each other have the power to lift a spirit even on our lowest day. 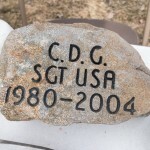 I am honored to have carried James’ stone and memories that afternoon, but this was just the beginning of the weekend that I spent with them. On Sunday it was time to uphold another part of the weekend I was looking forward to with James’. 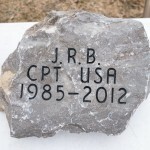 His stone was taken from their family fire pit where they have forged memories over the years and I brought him to mine. Throughout the afternoon my son, who is 5, helped me haul brush and tree limbs to our fire pit. It was a nice 60 degree day for some hard work and a bonfire. 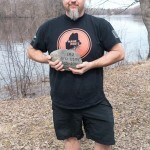 I placed James’s stone near me, just before touching off a 6’ fire in his honor. I’m sure he was smiling ear to ear. Hard work and being outside is something that both of our families love and I’m glad I could share that. I sat and reflected on the event the day prior and went over how things could have been done better and how I could have been a better leader. My next outing will be better due to this one. It’s all a learning experience and was very thought provoking. It was nice to have James’ ideals in my head while mulling it all over. 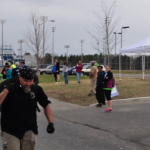 For my last adventure of the weekend I participated in the Healthy High 5K on the Orono campus on Monday. To say I didn’t look like the other racers is an understatement. I was dressed in my work shirt and heavy cargo shorts with no performance gear and no running garb like the other 500 people. I did, however, have my ruck and a sandbag on my shoulders. It was a very uncomfortable and heavy burden of 150lbs extra for the TSP families. It was the physical weight of a person that would be a constant reminder to me that we are never alone. I had packed all 4 of the stones we carried over the weekend in my ruck: Zimmerman, Brainard, Silk (who is from Orono), and Gelineau. The date of April 20 is important as Gelineau had given his life on this very day 11 years prior. It was threatening to rain on us at the start and all I heard was grumbling from a lot of people that they might get wet. HA! That is what people were worried about? It seemed petty to even hear this after the gravity of the weekend had set in. I was welcoming the rain with open arms. It was one final tribute to the amazing men for which we gave the weekend; to be completely humbled by the load and weather. The weather did not disappoint me. I finished in under 50 minutes and was met by Tom and Tony at the end with a warm embrace of new found friendship. 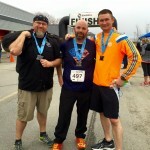 They had run the 10K after we had all battered our bodies at the ZFC, too. The bonds we make in life with complete strangers that hold the same values and goals as us are simply amazing. I learned so much about myself over the weekend I spent with James’s memories. I’ll never get to meet him, but his ideals and strengths will be taught to another generation and passed on. I will see to it. MHANF. 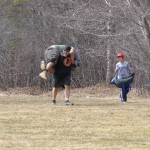 Posted April 18, 2015, at 7:55 p.m.
ORONO, Maine — Just after noon Saturday more than 40 teams of four set out to compete in a test that would push them physically and mentally. 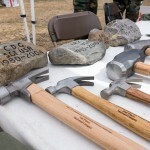 The fifth annual 1st Lt. James R. Zimmerman Memorial Fitness Challenge at the University of Maine campus in Orono had teams competing through a 6-plus-mile course of Marine Corps-like tasks. 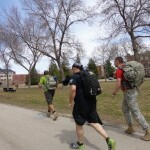 Teams first faced a 3-mile team pack run, where a weighted pack was passed around throughout the team around 12 laps of the university mall. 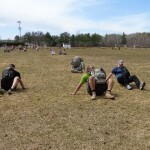 After completing the run, teams made their way behind the baseball field to complete a variety of combat fitness movements, including buddy carries, bear crawls and crab walks. 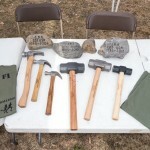 Then it was off into the woods for a 3-mile run with five fitness stations ranging from burpees to team pushups. Once out of the woods, the teams’ upper bodies were tested with pullups, situps, pushups and dips. 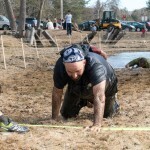 Once over 700 movements were made, teams made their way back toward the start to crawl through a mud pit toward the finish. The Zimmerman Memorial Fitness Challenge was established in 2011 to honor and remember 1st Lt. James R. Zimmerman, who was killed by small-arms fire while leading his Marines in Afghanistan in 2010. 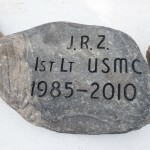 Zimmerman, a Houlton native, graduated from UMaine’s Navy ROTC in 2008 and was commissioned as a second lieutenant in the U.S. Marine Corps.